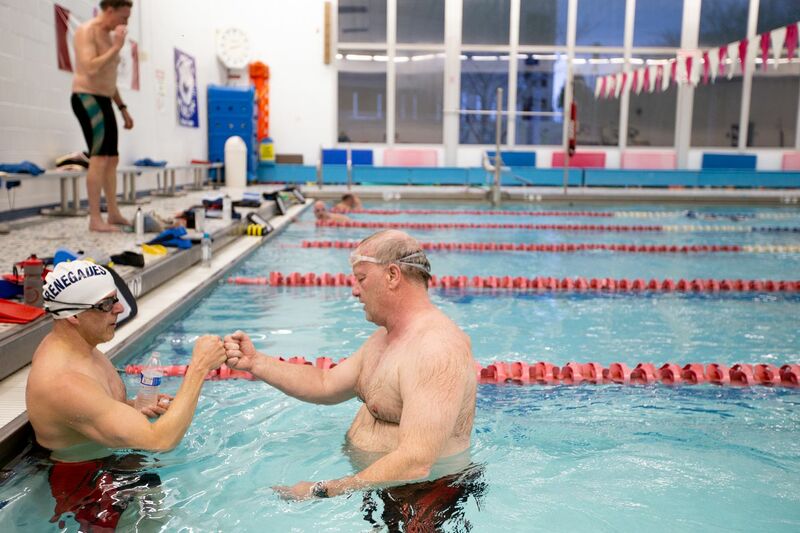 John Rosania (left) fist bumps Dave Scott after their Masters swim team practice at the pool at Rowan College's Pemberton campus. The pool is set to be shut down in August and some community members are fighting to save it. The 225-acre Pemberton campus of Rowan College at Burlington County is up for sale, and the school’s Olympic pool, canoe launch. and athletic facilities — amenities some have come to cherish — will officially shut down Aug. 15. But a group of more than 100 local residents have formed the Save the Pool Consortium to do just that. They want Rowan College to donate the entire campus to Burlington County and have it become part of the parks system. It is an effort that both county politicians and Rowan administrators say has little chance of success. Save the Pool organizers vow they will not back down, emphasizing that for nearly half a century taxpayer money helped fund the construction and maintenance of the Pemberton college campus. The Save the Pool Consortium was created in March to permanently protect the 45,000-square-foot athletic facility. The group says the space provides affordable, quality aquatic programs and estimates it is used by 1,800 residents weekly during the winter swim season. About one dozen public schools — including Lenape, Shawnee, Seneca, Cherokee, and Pemberton high schools — gather there for swim meets and, if it closes, will need to look outside the county because it is the only regulation-size facility. John Rosania swims on the Masters swim team during practice at the pool at Rowan College's Pemberton campus Friday, March 29, 2019. The pool is set to be shut down in August and some community members are fighting to save it. Rosania and his Masters swim team — a national organization for adult swimming — have been using the pool every week for practice and training for more than a decade. His son, a Shawnee High School swim team member, also will be affected by the shutdown. The beginning of the end for the Pemberton campus of Rowan College at Burlington County dates back to the college’s decision to focus on its new Mount Laurel campus rather than improve the Pemberton site. The college said it would cost $47 million to rehab the rural campus, and in 2017 classes were no longer offered there. Greg Volpe, executive director of marketing for Rowan College, said the college will not donate the land and is seeking offers on the Pemberton campus to allow expansion in Mount Laurel. Jeff Woodward, a coach and swimmer on the Masters swim team, keeps time during practice at the pool at Rowan College's Pemberton campus. The pool is set to be shut down in August and some community members are fighting to save it. Members of Save the Pool Consortium feel slighted that the college has decided to sell the property instead of giving it to the county. They note that $4.125 million of Rowan College’s $44 million operational budget for 2019 was paid for by taxpayer dollars, given to RCBC by the Board of Freeholders. Tom Pullion, Burlington County’s freeholder director, said the county does not plan on allocating more money to the facility. He cited costs, including a possible tax increase if the county assumes control of the property, and the belief the facility is used by only a small number of residents. “Everybody feels very bad, including myself,” Pullion said of closing down the pool. “As stewards of the county, we have to be fiscally responsible for the residents of Burlington County. When the school tells us that it takes over half a million dollars to maintain and is getting ready to shut down, it’s very hard for us to say, ‘Yeah, we’re going to go pump all that money into that place.’ "
Donna Hill, a teacher at Lenape Regional High School, said that for more than eight years she and her family have attended swim practices, meets, and birthday parties at the Pemberton campus. She said it will be a disservice to the high schools if it shuts down. For Melman, of the Save the Pool Consortium, all Burlington County residents will be affected by a sale. “The argument for me is that we’ve already paid for everything,” she said. “At some point in time, the county taxpayers are going to be on the hook for that campus because if the college cannot sell the campus, which so far it has been 100 percent unsuccessful at selling it, eventually those buildings are going to have to come down. And it’s the county taxpayers that are going to pay to tear everything down.